Shipped out of Toronto in 1958 – along with Jimmy Thomson – due to their assistance regarding the organization of the National Hockey League Players' Association, Tod Sloan would then see three seasons of action in the Windy City, culminating in a Stanley Cup championship in his final NHL season, in 1961. Originating from the Sloan family, we have a wonderful group of items featuring Tod’s time with Chicago. Included, we have his 1961 Chicago Black Hawks Stanley Cup championship team alumni watch, 1960-61 Stanley Cup pendant mount (middle portion of pendant only), 1996 alumni plaque, 26 signed 1958-59 Chicago Black Hawks team pictures, 2 modern Black Hawks jerseys with “Sloan” nameplates, Hawks alumni membership cards (2) and more. A Sloan family LOA will accompany. The alumni watch was made by Seiko and exhibits heavy wear, with a Black Hawks Indian head logo over the dial, along with “#9 Tod Sloan 1961 Stanley Cup Championship Team” engraved over the reverse. 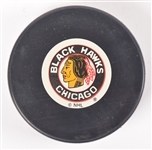 The 1961 pendant mount is just over half an inch with an embossed Hawks logo, with this originally mounted to a slightly larger circular base encompassed by the player’s name along the top and the date of “8-23-61” along the base. 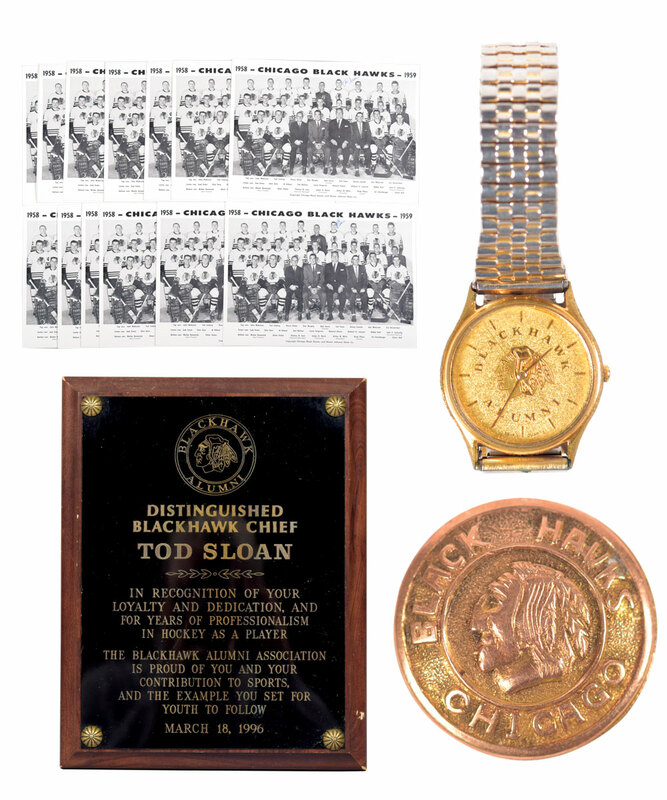 Next, the alumni plaque is 7” x 9” with an engraved metal plate affixed listing the particulars along with “Distinguished Blackhawk Chief” and “Tod Sloan”, along with the date of “March 18, 1996”. The plaque shows surface wear, with a few blemishes to the finished wood. The signed 1958-59 Black Hawks team photos are all 8 ½” x 11 ½”, with Sloan signing each near his image in ballpoint. The modern jerseys include an example with the 1991 All-Star Game patch and handwritten “56” sizing, while the second example feature’s a vintage style crest and measures-out to roughly a size 54.